The need for intelligent security systems, dwelling infrastructure, rising criminal activities are the few factors that have resulted the demand for reliable and intelligent security systems. The advantages of surveillance systems over physical security such as ability to allow remote monitoring and continuous monitoring have resulted for their wide deployment across Brazil. Traditionally controlled by analog based surveillance systems, Brazilian market is now shifting towards digitized i.e. IP based surveillance systems. These surveillance systems are finding their space across industry verticals, namely, government & transportation, banking & financial, retail, commercial, industrial and residential. According to 6Wresearch, Brazil's Video Surveillance market is projected to reach $1.5 billion by 2021. In 2014, though, analog based surveillance systems have accounted for major share in overall market, but IP based surveillance systems are expected to grow with relatively higher growth rate during 2015-21. Growing demand for remote access, expanding IP infrastructure, increasing IT spending and declining prices have spurred the market for IP surveillance systems in the country. The report thoroughly covers the market by surveillance types, by verticals and by regions. The report provides the unbiased and detailed analysis of the on-going trends, opportunities/high growth areas, market drivers which would help the stakeholders to device and align their market strategies according to the current and future market dynamics. • Market Size & Forecast of Brazil Video Surveillance Application Market until 2021. • Historical data of Brazil Video Surveillance Regional Market for the Period 2010-2014. • Market Size & Forecast of Brazil Video Surveillance Regional Market until 2021. 12.2 Bosch Security Systems, Inc.
12.8 Hangzhou HikVision Digital Technology Co. Ltd.
Upcoming Olympics 2016, expanding public infrastructure, increasing security spending and surging IT spending are spurring the market for video surveillance systems in Brazil. In the country, video surveillance market is primarily driven by analog based surveillance system due to their low cost and ease of installation. Over the next six years, higher growth of IP based surveillance system is anticipated due to rising IT infrastructure in various verticals across the country. By 2021, Brazil is expected to contribute predominantly in-terms of IT spending. The growth in IT spending is exhibited especially from government, and banking & finance sector. In the forecast period, growth of video surveillance software market is anticipated to be much higher owing to demand for video analytics market. Criminal identification and need for alerting any unwanted activities would drive video analytics in Brazil in the coming years. The key players in the market include- Axis Communications, Bosch Security Systems, Pelco, Honeywell, Milestone Systems, HikVision Digital, Dahua Technology, IndigoVision, Vivotek, and Arecont Vision. 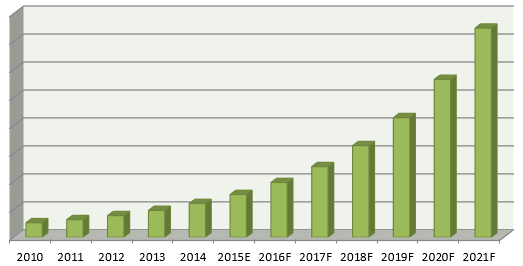 “Brazil Video Surveillance Market (2015–2021)” report estimates and forecast overall Brazil Video Surveillance market by revenue, by Video surveillance system type such as Analog based, IP based, and Software systems, by application, and Video Surveillance system by regions such as south, north, north-east, south-east, and central-west. The report also gives the insights on competitive landscape, market share by companies, market trends, company profiles, market drivers and restraints.